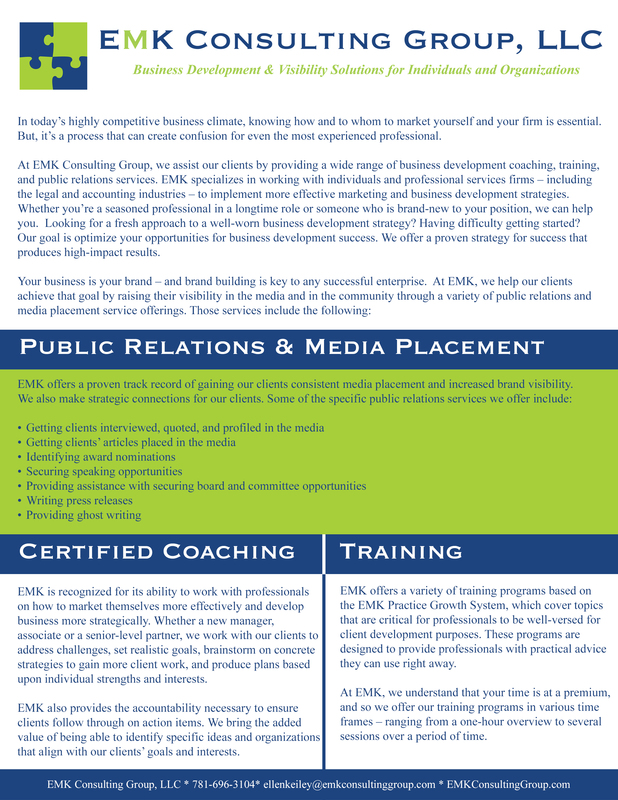 One of the primary ways in which EMK Consulting Group assists its clients is through business development coaching, training, and public relations. EMK specializes in working with individuals and professional services firms – including the legal and accounting industries – to implement more effective marketing and business development strategies. Whether you’re a seasoned professional in a longtime role or someone who is brand-new to your position, we can help you. Looking for a fresh approach to a well-worn business development strategy? Having difficulty getting started? Our goal is optimize your opportunities for business development success. We offer a proven strategy that produces high-impact results. Your business is your brand – and brand building is key to any successful enterprise. At EMK, we help our clients achieve that goal by raising their visibility in the media and in the community through a variety of public relations and media placement service offerings. We regularly get our clients quoted, profiled, and interviewed in regional and national media outlets, such as The Boston Globe, The Washington Post, The Wall Street Journal, NPR, Boston Business Journal, Massachusetts Lawyers Weekly, as well as trade publications. Phase 1, “Intake/Discovery” We will meet with the client to learn about their practice, marketing and business development activities, specific challenges, and identify strengths and interests. Phase 2, “Strengths-Based Marketing & Business Development Plan” We work with clients to set realistic goals and produce an individualized plan based on strengths and interests designed to assist the client in reaching their goals in a way that will work specifically for them. Some of the topics covered in this phase include: Marketing & business development activities; cross selling; time management; networking; relationship building; professional & community involvement; developing a niche; personal brand; the elevator speech/clarifying your message; follow-up; how to ask for business; client retention; and gaining more work from existing clients. These topics are covered during coaching sessions and offered in our training workshops. Increased knowledge in these areas will facilitate more effective marketing and business development activities. Phase 3, “Coaching/Accountability” We will work with the client to brainstorm and come up with concrete strategies to gain more client work. The client will leave each session with a series of action items, and we will provide the accountability necessary to ensure follow through in individual coaching sessions and/or future training sessions. EMK firmly believes that, with the right business development coach and public relations consultant, there is an absolute return on investment. EMK thrives on personal interaction, and we bring a high level of energy and enthusiasm for marketing, business development and public relations gleaned from more than 20 years of professional experience. EMK’s expertise can benefit a wide range of professional services clients. One of EMK’s key differentiators, given the extensive network of firm President Ellen Keiley, is its ability to connect clients with the right people and organizations based on their target audience and needs.